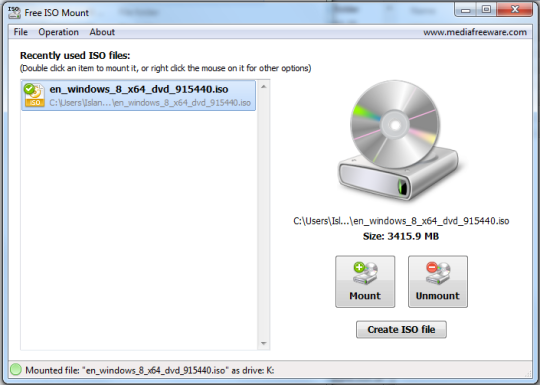 A Free ISO Mount enables the user to access the content present in the ISO files in the same way as it is available on an optical CD. The software makes it easier and faster to install ISO images onto a device when compared to recording them on any CDs. An ISO is better known as a virtual copy of the CD. Therefore, when the Free ISO mount tool is used, the images can be viewed much faster. Though it sounds complicated, the actual process is very simple and can be done within a few minutes. The user can do it simultaneously whilst checking the step by step process of the same. The first thing to do is to open the folder containing the ISO image. The next step would be selecting the drive letter and mount; the user can choose any drive letters such as D, V, C, etc. Once this is done, a virtual drive will be displayed on the screen. This is the place where the Free ISO Mount will help the user in opening the contents of the disc, browse through them, etc. When the user is done with the same, the 'Eject' button will complete the whole process. The ISO Mount supports a large number of operating systems and hence, is a very useful tool. This is a very good option when a user has downloaded software in the ISO format and wishes to install it. When compared with all the other methods, the Free ISO Mount saves time and is much simpler. The tool has different tabs which help the user to know more about the drive, make changes, etc. The amount of space that has been used for the mounting is also displayed on the device for future reference.